In reading around on reactions to the defeat of the TAA (Trade Adjustment Authority) component of the TAA/TPA (Trade Promotion Authority) Package needed to successfully pass TPP (Trans Pacific Partnership) I get the usual incomprehension as to why Democrats can possible oppose Free Trade given the proven mathematical reality of Ricardian Comparative Advantage. And the reason is simple, perhaps too simple for those educated in the higher maths of your typical Econ curriculum, Democrats are using democratic arithmetic. 50% of the net gain flows to the top 1%, 20% to the 2-10%, 20% to the 11-30%, 10% to the 31-50%, 0 to the 51-70%, and -10% to the 71-100%. Is this a good deal? Well even before you discuss possible offsets, it clearly is a great deal to the top 1% and a good deal to the top 10% but the benefits get pretty attenuated when spread over the top 50% while they range from zero to a net loss among the lowest 50%. And given this distribution this is true no matter how eye popping the top line GDP growth number gets. Which raises the question: why should small d democratic majorities vote for this? Which is a reasonable answer if you have a roof over your head, and sufficient food, and available health care. Because if not your world doesn’t seem that safe at all. Three. “Voters simply are not rational, they don’t understand the simplest most truistic arguments about Comparative Advantage and insist on nattering about redistribution (as if anyone cared about that) so lets take away their vote by reapplying a property qualification for voting”. One maximizing ones self interest is not only rational, it is virtuous. Two democratic majorities looking to their own interests are simply selfish. But you can’t square that circle with pure representative democracy. (Or with Ayn Rand’s The Virtue of Selfishness) Because why NOT a calculation of interest based on that of the majority? Which given the general commitment in the West to some form of representative democracy leads to the impasse of the post title. Damn 50 + 1. Well, for one thing, many Democratic representatives have figured out that this really isn’t about free trade. It’s about giving multi state corporations power to blunt local regulations that might impair their potential profit. Regulations relating to the environment, worker safety, public health and the like. The same objections, in spades, will arise when the international finance agreement rears its ugly head. If we were to look at it in another manner to strengthen your points. Those making >$1 million are ~400,000 taxpayers of which the average income is ~$3 million. Bary Ritzholz has a nice post which has a graph illustrating income by percentage of taxpayers. 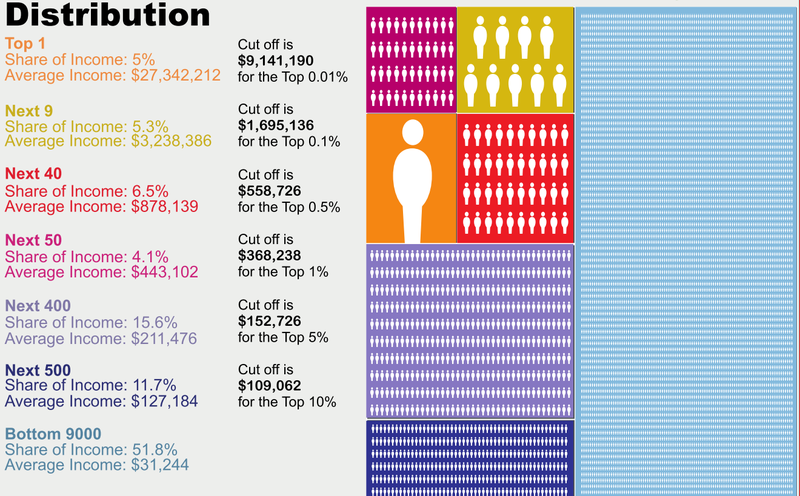 http://www.ritholtz.com/blog/2011/10/forget-the-top-1-look-at-the-top-0-1/ The top .01% represents .01% or 15,000 taxpayers. If we follow the argument, the trade agreements would be benefiting the top tiers. I have found the news coverage of the failure to pass interesting in that everyone I have heard is simply presenting it as a trade agreement with the underlying message that being against it is being against trade. The other issue not discussed much that I think in the immediate moment is the TAA. As I have thought and others at various blogs have mentioned: Training for what? What kind of training can possibly be given that will offset the loss of jobs in an ever diminishing production sector of the economy? Hedge fund management? Finance advisor? Hey, maybe we need more economist. Yeah, that’s the ticket. My recent worry is Ha-Joon Chang’s worry that giving American corporations greater access to developing economies chokes off their infant industries (phrase originated by that guy on your ten dollar bill). As a 24 hour snap shot, opening up infant markets may be better for everybody — but 5, 10, 15, 20 years down the road we are actually keeping the poor world poor. TPP also gives our pharmaceutical octopodes the chance to hold more ill people hostage to higher prices internationally as well as nationally. You mock the straw man response of your unequal distribution argument, but you nowhere support your “what if” distribution arithmetic. Shouldn’t the bottom 50% consider just the possibility of a bribe/compensation to be a sufficient payoff? How about if we take one-tenth of the top one-percenters’ gain and make it into lottery prizes and distribute lottery tickets to the bottom fifty percent? Even better, we could make it a reality TV show where people compete for the prizes by groveling! And to the Denis/Ha-Joon Chang concern, the British after crushing the Indian cotton cloth trade in the 19th century in favor of Lancashire mills did in fact provide their own kind of subsidy. They gave India Cricket. What ho! A leg before wicket!! Dismissed! Quite literally the least they could do. W.P. Your comment was stuck in moderation. I unstuck it. As to supporting my “What if” I suggest you look up the definition of “hypothetical”. And maybe after that take a look at the figure that Run posted above. Income inequality is a fact. And almost everyone agrees that NAFTA did not have positive effects on jobs and did displace manufacturing, notably in car parts to Mexico. And nobody really disputes that there has been wage stagnation over the last thirty five years WHATEVER the cause. So demanding that I provide specific numbers to support a HYPOTHETICAL is a little over demanding. Because my point, in part, is that advocates of Free Trade almost ALWAYS START AND STOP their arguments from FIRST PRINCIPLES like the ones that Sandwichman mocked and don’t themselves supply numbers. Fell free to backfill the Free Traders and provide data showing the benefits of Free Trade to the lower 50%. Me I am just putting up a plausible and HYPOTHETICAL set of numbers to give people a jumping off point for discussion. So jump off! And take that in any sense you like. Now, not only do tariffs have to be kept low, but corporations are to have the right to some private court where our state, and federal governments could be defendants. What sort of machiavellian nonsense is this? If you believe that our national security depends solely on our military personnel and military hardware then you would make good cannon fodder. If you believe that our national security does not require a thriving domestic manufacturing sector then you would make good cannon fodder. Sooner or later the population will recognize that Global Free Trade has ruined a lot of them. Then what will they call US corporate leaders, US trade negotiators, and US elected leaders who took a thriving economy and reduced it a point where a very large segment of the population depends on government welfare? Incompetence seems a poor defense for treason. Year after year of trade deficits, rising total household debt and stagnating wages, but they did not see the harm? The Romans threw their traitors off the Tarpeian Rock. What goes by the name “Free Trade”, or sometimes “The Washington Model for trade agreements” is based on obsolete and discredited economics. This is because the Ricardian Comparative Advantage doesn’t take externalized costs of production into account. We should be basing our trade on the true cost of production of goods and services. A manufacturer or service provider in a country like the US has costs that include contributing to health insurance cost, SSI taxes, unemployment insurance, and those associated with meeting environmental, occupational safety and health regulations, product safety standards, building and fire safety codes, labor standard, etc. regulations. An additional cost, the “cost of carbon”, should soon join this list. By having his products manufactured, or services provided in a country which doesn’t have such extra costs, he is able to sell his products or services in the US at a high profit, at a fraction of their true cost, and acquire tax advantages in the process. It doesn’t matter whether that other country has no laws or regulations in each of these areas or simply fails to adequately enforce them. We are told that the, still mostly secret, Trans Pacific Partnership will include provisions to force our trade partners to develop and enforce regulations pertaining to some of those “externalized costs”, but that would be a very inefficient means of achieving “fair and balanced” trade. Enforcement would be slow and expensive and would necessarily involve an independent third party or tribunal. A much better solution would be to just do it ourselves and add tariff costs to replace those avoided costs for each country and class of products. The justification for the tariffs should be reviewed at intervals and decreased, eliminated, added, or increased as appropriate. Existing “Washington Model” trade agreements would have to be renegotiated to include such provisions. If renegotiation is not possible, we should withdraw from the agreements. It would be better to risk a possible trade war than continue down the path toward a lowest common denominator, highly unequal, economy that we are on. You make the same argument I have made innumerable times on costs of manufacturing or services. It is the Overhead much more than the direct cost of Labor which creates the advantage or disadvantage. Hi Don. As a first time commenter your comment was briefly caught in moderation. This should be a one time occurence here at AB. Welcome. I asked some Indians in a nearby park the other day why they adopted cricket and the Irish who are a lot closer to England did not. Now I know. These may be technical terms well understood by everyone. Except everyone else. I use SS when I mean Social Security (OASDI) which is an insurance and savings program, paid for by the workers who will get the benefits. It is very important that people understand this has nothing to do with “the budget,” and it is not “welfare.” And it is important that it stays that way. Thanks for this post. The “fact” of comparative advantage needs this kind of careful counterargument. I learned the math of comparative advantage when i was a child too young to understand it. So I believed in it until a president i voted for pushed for NAFTA. It was shortly after it passed that i began to understand the mathematics in the absence of understanding is just another forom of nonsense. WE need to pass the a “Balanced Trade Act of 2015”. This should include a variable rate tariff to correct for all trade imbalances including China, Japan, S. Korea and Mexico. This act should also include all the other provisions to correct for currency manipulation, ISDS of patents, copy rights ect. It should also set new environmental and human rights standards. “If you want to play you have to pay” should become our new national slogan. This would do more to correct for the American class warfare- income disparity than all the tea in China. I do highly agree with the comments made by Jim H. and Don Phillips . And to Colerby and Kai HK, you both know that NAFTA was a complete sell out of the American people that the government allowed starting with Clinton . And by the way when talking about Reagan and the air traffic controllers strike-union bust job. What would have happened if all the controllers in the whole country had stood behind those fired workers? Last thing, I don’t think that Apple is stupid enough to move all to Singapore because they know what side their bread is buttered on. Don’s statement earlier: “What goes by the name “Free Trade”, or sometimes ‘The Washington Model for trade agreements’ is based on obsolete and discredited economics. This is because the Ricardian Comparative Advantage doesn’t take externalized costs of production into account. We should be basing our trade on the true cost of production of goods and services. A manufacturer or service provider in a country like the US has costs that include contributing to health insurance cost, SSI taxes, unemployment insurance, and those associated with meeting environmental, occupational safety and health regulations, product safety standards, building and fire safety codes, labor standard, etc. regulations. An additional cost, the “cost of carbon”, should soon join this list. Direct labor cost is such a small ratio of the cost of manufacturing in comparison to Overhead and Materials, it is ridiculous. Don in his earlier statement on this post makes a very valid point. Companies outsource to the US to avoid these external costs relevant to operations in the US (Overhead) and not the Direct Cost of Labor to manufacture product. It also is relevant to the service industry. Find an economist who will agree to what Don has said and what I consult in and you would have a rare find. Then too, 99% of them have never been in manufacturing or worked in a plant. As to NAFTA/Mexico and Canada. Canada was fastidious or smart enough to write exclusions into their NAFTA agreement. The US didn’t the same as leaving Wall Street to TBTF and Investment Firms which were supposed to put in place a Clearing House for derivatives. The market place did what they are good at “being greedy” and the rest is history. Canada is the US largest trading partner. Mexico is another story though. What would you do with a country full of unemployed people looking to make a living and living next door to you? Build an iron wall between us and them? Or perhaps develop the country with jobs so they might stay home? To make matters worst, highly labor intensive jobs will move from a highly capitalized country such as the US to those less capitalized such as Viet Nam, Malaysia, Philippines, etc. actually, I knew that NAFTA was a bad deal. I thought that might be clear from the rest of the paragraph. for what it’s worth, i don’t think you’ll get much results from your proposal because it doesn’t matter much what we the people think… mostly we don’t know what we think. the united states and great britain did not become prosperous countries because of free trade. neither of them allowed free trade while they were growing. free trade only became prosperous to the owners after they became big enough to dominate that trade. one of the flaws with “comparative advantage” is that it does not allow for growth. sure it might be to the advantage of both countries (but not to their people) for each to specialize in what they do best. but if you specialize in manufacture and i specialize in providing raw materials, i will never develop my manufacturing to the point where it can compete with you and make me richer. i’d have thought that some economists might have pointed this out by now. but the fact is that you never hear from economists who don’t say what the owners want to hear. “trade agreements” have nothing to do with trade. they are the mean by which international corporations get to overrule “local” laws. they don’t care about competition. competition would mean that companies would compete to meet the changing circumstances, including changes in laws. big companies don’t want to have to bother with all that. And you do not believe that raising tariffs would have any impact on that? This appears to be dangerously close to the Republican mantra. In fact, I am not sure there is a difference. We have always had a high school dropout problem. We also have a problem with high school graduates who can barely read much less fully comprehend all that they have read. How will they earn a living? That problem is much more easily dealt with than having our ‘country full of unemployed people looking to make a living’? Tariffs are what built this nation (if I recall some history). We may not look at it in this way, but tariffs or some such handicapping mechanism is the means to balance labor’s limited mobility from capital’s near frictionless mobility (especially in the digital age). We don’t need to necessarily use a tax, we can do it with quotas of some such, content minimums and limits, restrictions on government contracts, etc. Sure we use these now, but not in a way that makes the global corp cry. But, a tax, considering digital banking would be the simplest.